Kanchipuram Idlis are my favorite, especially since Amma makes a special Kanchipuram Idli Podi for it. The spice powder that gets prepared for Kanchipuram Idlis are different from the regular podi she makes and that makes it all the more interesting one to make. When I had made this idli for Hubby dear the first time, he was so much taken in by that dish. Though the preparation time is no less than the usual idlis, it still made lot of difference to his liking as he normally doesn’t like the plain, bland idlis he says. Though I can eat idlis all three times a day. When I was discussing with Amma that I haven’t taken up my 101 Dosa Varieties, she suggested this Kanchipuram dosa. I knew right away that this was another delicious version. I have no clue if this is a part of the Kanchipuram town or why this has that name. All I know is, we liked this a lot and Konda especially who doesn’t like anything in her dosa, actually wanted those other items removed and given to her. She is still not got into the habit of eating onions or other ingredients added to Dosa batter. Today is the final day for the Group 1 bloggers doing the Blogging Marathon. It has been another fantastic round. I will be doing another post to join the Group 2. I hope you all enjoyed as much as we did. Once the batter is ground, mix in the curds to the batter and ferment overnight. Heat a tawa, grease with oil. Spread out one ladle ful of batter as the regular dosa, Simmer, cover with a lid and don’t flip over. 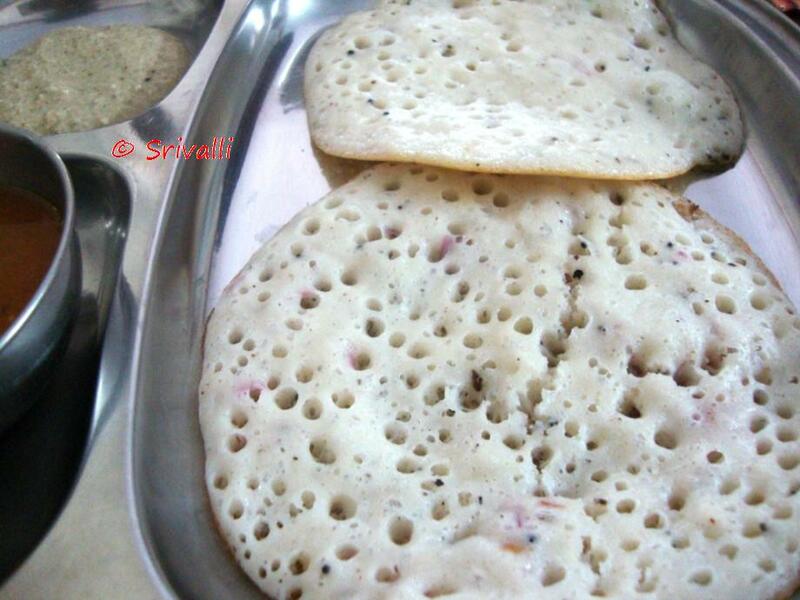 The dosas are very soft and has a wonderful taste with the sour coming from the curds. This is joining Supriya who is having a month long celebration of Dosa. My goodness. Look at those holes. I am sure I will love this dosa. Where is the recipe for the special podi that your Amma makes to go with this? so fluffy dosai.love the texture and picture. They look so soft with that cute pores…. wow…fluffy and wonderful finish valli…. Thanks for sending this along, and the other dosa recipe as well Srivalli. This looks delicious. I make kanchipuram idly. dosa is new to me. Love this version. Will give a try for sure. 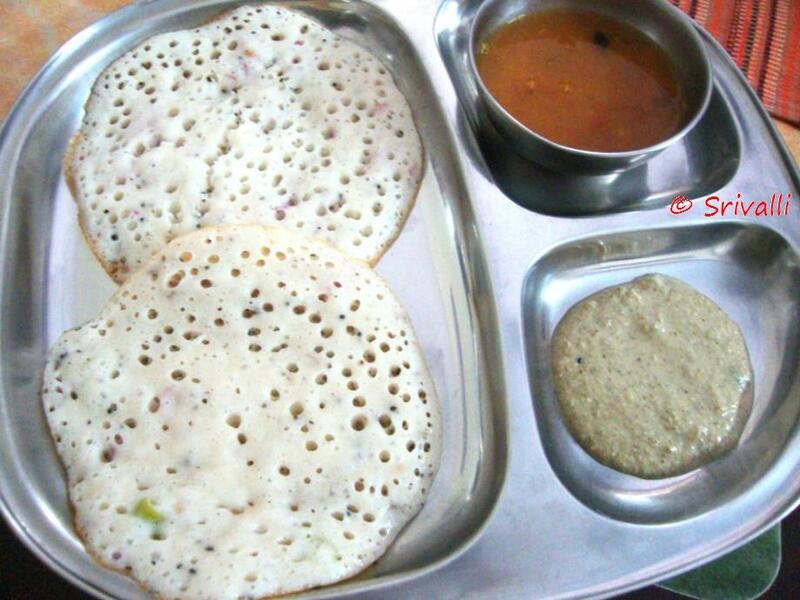 Dosa looks excellent, never tried making this dosas,thanks for sharing Valli..
Love kanchipuram dosa, very spicy one. Dosa looks so soft anf fluffy …should try this soon.. The dosa is looking great…very soft and sumptous ! oh that food platter makes me hungry now…dosa looks perfect n irresistible..yumm! Looks so soft and fluffy. Kids can have this without any fuss. The dosas looks super-soft and spongy… Sooo goood..
Srivalli, this is really delicious, I am going to give this a try and let you know how it turned out. Softy Softy Dosas!!! Adding curd, does this magic, Let me try this next time!!! !